Refill with our popular Disinfecting Wipes. Screw mounted on the walls of your facility, health or fitness club (no wall space? Other mount options available, please contact us!). Members pull up to dispense a single wipe, and will appreciate your commitment to their safety. 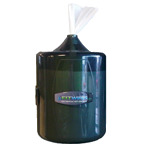 These dispensers are made in Canada of the highest quality materials and are guaranteed for 2 years. The smoke colour will blend in with every decor.